For only the second time in history, the first being exactly 60 years ago, Bridport Town FC made it into the third round of the FA Cup qualifiers. 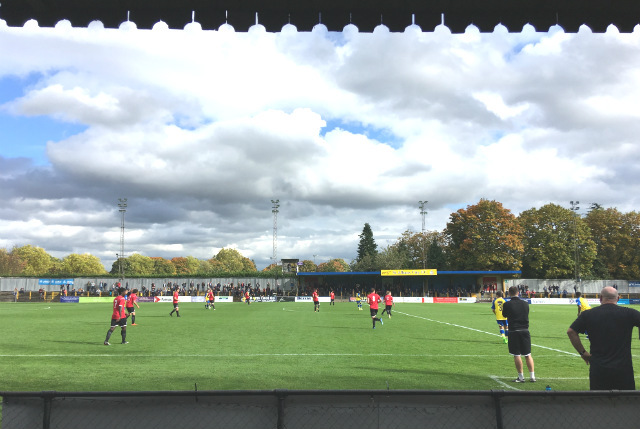 They were drawn against St Albans City, three divisions above them. St Albans is my home town so I went along to watch. Having never seen the Bees before I was a little disappointed to see they were wearing red kits rather than black and yellow stripes! Thinking my loyalties might be torn, I found myself supporting Bridport. I do like an underdog and they needed all the support they could get! And the match? In the first half Bridport went down two goals but rallied in the second half to bring it back to 2-1. The last 10 minutes or so was all pressure by the Bees. The St Albans crowd was visibly anxious. But Bridport just couldn’t get that equaliser and the match finished 2-1 to Saints. Good effort though.